Reports of a card skimmer found at a local gas station serves as a reminder that fraud comes in all forms. 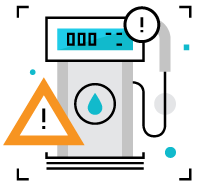 A card skimming device is a piece of equipment fraudsters attach over card readers at ATMs or self-service payment kiosks at gas pumps, parking garages and elsewhere. Skimmers can also be installed inside the gas pump. During the legitimate transaction, a card passes through the skimming device that illegally captures the card number. Criminals may also install a camera nearby to simultaneously record the cardholder’s PIN as it’s entered. Thieves then retrieve the card skimmer and the stolen card information. At the gas pump, the security seal tape on the fuel dispenser door should NOT be broken. If there is no tape, check to see if the dispenser door looks as if it's been forced open. Before you insert a card into any self-service payment kiosk, look at the plastic surrounding the card reader. It should look permanent and professional and all pieces should be securely affixed to the machine, not loose. Be alert for any pieces attached to the machine that look out of place or as if they are not part of the originally manufactured machine. You should NEVER be able to remove any cover that’s on the card reader. Also, businesses and financial institutions do not point a camera toward the keyboard. If you are suspicious that an ATM or a self-service payment kiosks has been tampered with, DO NOT use the machine, and contact your local law enforcement immediately. If you believe you are the victim of fraud or identity theft, please contact Dupaco immediately at (563) 557-7600 / 800-373-7600.